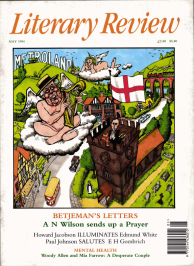 More than of any other dead poet, England hath need of John Betjeman. This volume will be some compensation for his physical absence. By an act of editorial necromancy, Candida Lycett-Green has summoned her father to life again. Long before there was a gallery to play to, the Betjeman show was in full swing. That is the extraordinary fact revealed by these letters. Those of us who did not know him personally, but love the late Laureate as a famous poet or television artist, will find our hero, long before he was heard of. Here he is being Betjeman: that extraordinary mixture of whimsy and learning, high camp and serious piety, idleness and prodigious energy.